A small part of Erkki's Hutamo's collection. 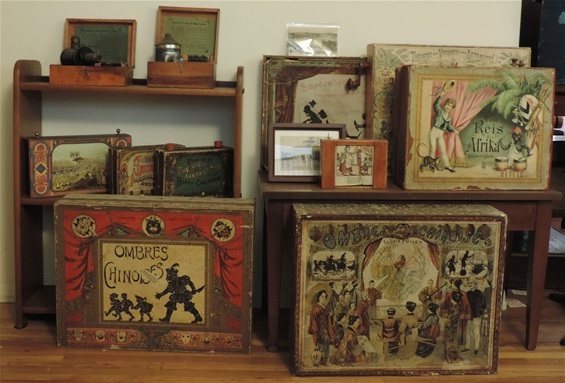 This photo shows toy moving panoramas, shadow puppet shows and magic lanterns made for children. Erkki Huhtamo is a professor at UCLA's prestigious Deptment of Film, Television and Digital Media. He is a Media Archaeologist, Historian, exhibit curator and author of Illusions in Motion. In the 19th Century, moving panoramas came in all sizes. 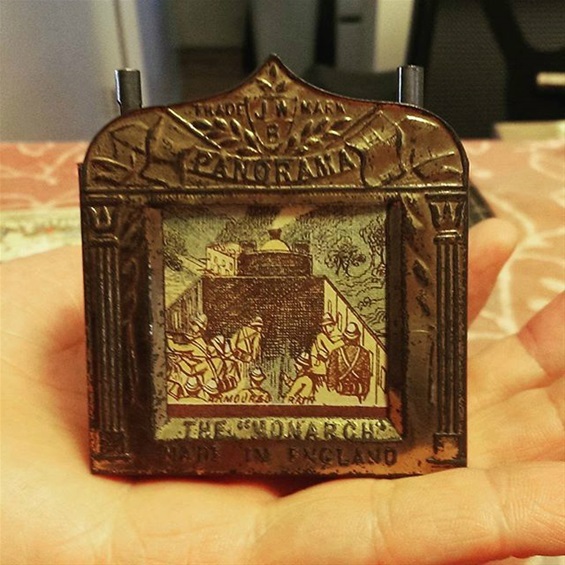 The examples below are commercially made miniature or toy moving panoramas. The scrolls range in size from a couple inches to around 8 inches in height. Three and a half minutes into the film you will see a very unusual piece - a traveling showman's, hand-cranked scrolling, peep show of landscape scenery. Thank you for making these films Erkki! Sept., 2017 - This is the first in a series of videos from Erkki, this one focusing on magic lanterns. Stay tuned for more. Excursions on Land and Sea: The Word's Wonders. Toy panorama. Images printed on translucent paper. The scroll is advanced by means of a crank and pulley system. It is illuminated with a candle and there is a hole in the top of the box (not visable here) for smoke to go through. It's no wonder that very few of these have survived! A quick look at a fraction of Erkki's collection of pre-cinema artifacts. This was filmed in 2013 in his office at UCLA. 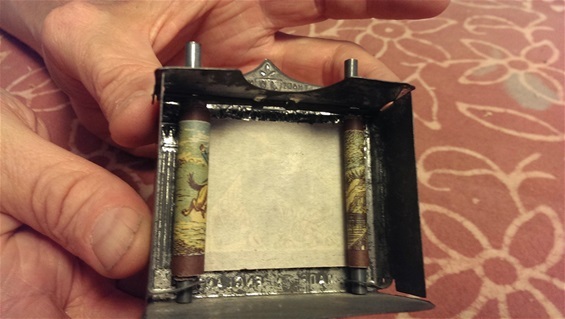 He demonstrates a Zoetrope, Mutoscope, Kinetiscope and you will see glimpses of some of his moving panoramas. 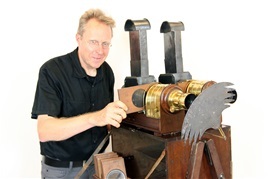 Erkki Huhtamo with his L. J. Marcy dissolving magic lantern pair (Philadelphia, c. 1870). Photo: David Leonard. In 2002, Erkki published the 22 page article Global Glimpses for Local Realities: The Moving Panorama, a Forgotten Mass Medium of the 19th Century. It's a nice introduction to moving panorama history and the precursor to his EPIC book, Illusions in Motion published in 2013. Wonderful storytelling. The Maréorama was a huge multi-sensory moving panorama created by Hugo d'Alesi and his team for the Exposition Universelle of 1900 in Paris. Working from high-resolution scans of the moving panorama scroll and the original piano music composed for the Maréorama by Henri Kowalski, Huhtamo reconstructs several sequences from this simulated sea voyage on the Mediterranean. This is an hour-long presentation. Sit back, relax and enjoy!